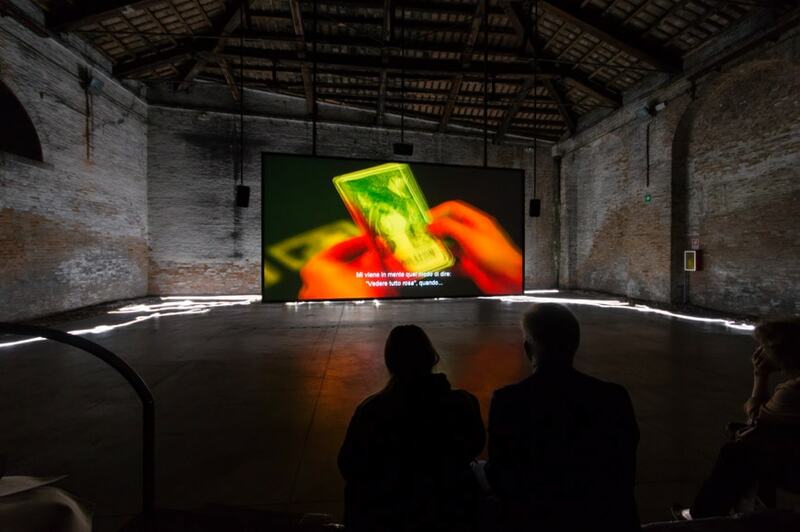 Curated by Cecilia Alemani, Il Mondo Magico (The Magic World), the exhibition in the Italian Pavilion at the 57th Venice Biennale of Art, is composed of three spaces which accommodate a sequence of three installations created by Roberto Cuoghi, Adelita Husni-Bey, and Giorgio Andreotta Calò. All three artists share a vision in which imagination is a tool to see beyond visible phenomena and experience the world “in all its richness and multiplicity”, as the curator says. The title of the exhibition, Il Mondo Magico, is borrowed from that of the best-known book by anthropologist Ernesto de Martino, published in 1948, which described magic rituals as the tools through which individuals tried to find their own identity in uncertain historical and social contexts. 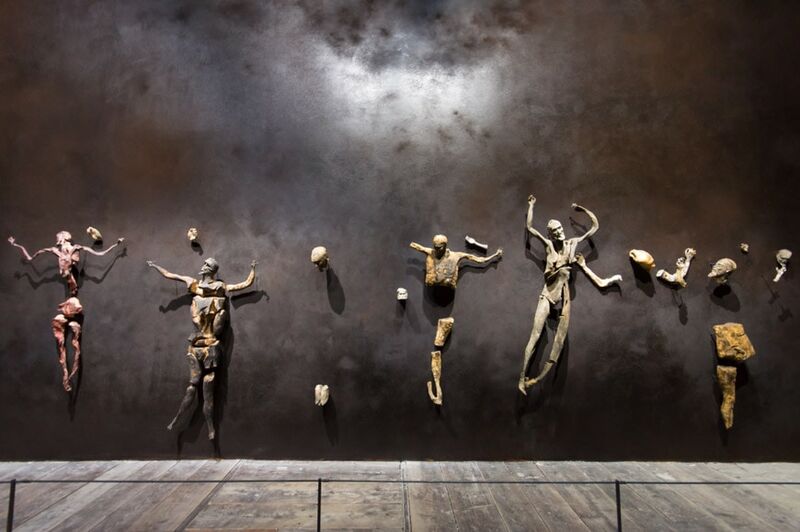 Imitazione di Cristo (The Imitation of Christ) by Roberto Cuoghi, the first of the three installation presented in the pavilion, investigates the transformation of matter and the fluid concept of identity through a research on the historical depiction of Christ in Italian art. 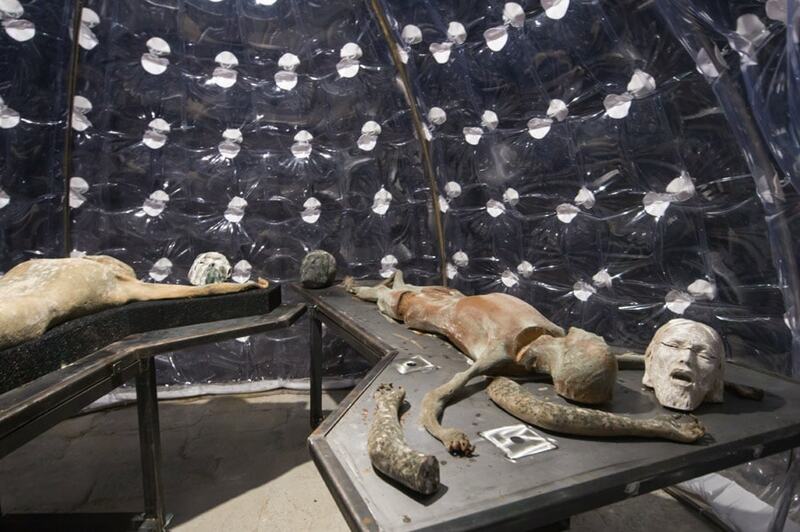 The statues, almost decomposed, are subsequently “dried” in an oven to stop their decay. 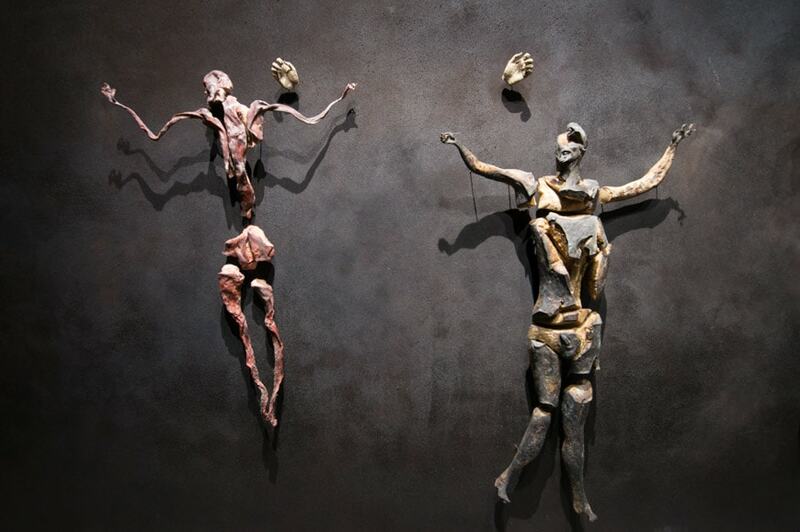 Finally, the remains of the figures, distorted and broken to pieces, are re-composed and arranged on a long, dark wall at end of the gallery. In The Reading, the installation of Adelita Husni-Bey, a video documents a workshop aimed to explore the relationship between people and earth, with a particular focus on elements such as exploitation value and vulnerability. The artist – who frequently investigates issues connected to race, gender and social class also by the means of innovative pedagogic theories – used tarot as sort of magical means to communicate with the young people participating to the workshop. The tarot were designed by Husni-Bei during the protest of the North Dakota Native American groups against the construction of an oil pipeline on their land. 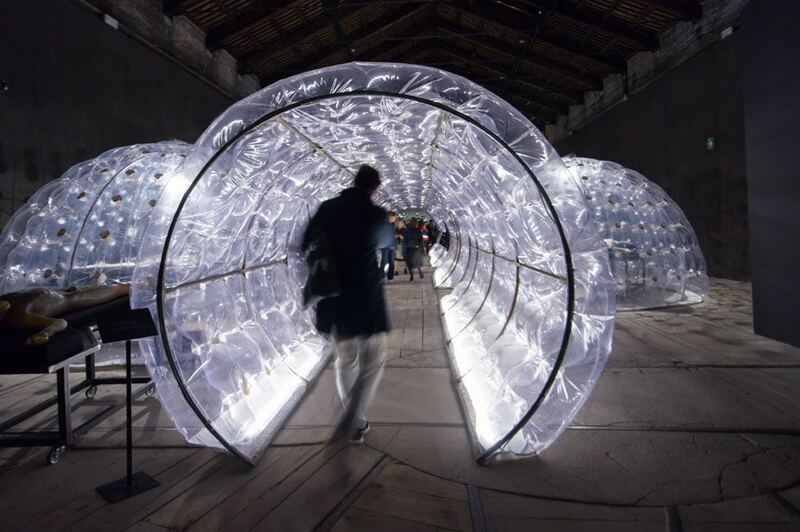 Senza Titolo – la fine del mondo (Untitled- the end of the world) by Giorgio Andreotta Calò is a large-scale installation conceived in relationship to the architecture of the pavilion. The work is composed of two parts. In the lower part the visitor has to walk through a sequence of scaffolding which divides the hall into five aisles in order to reach the stair leading to the upper part of the installation. 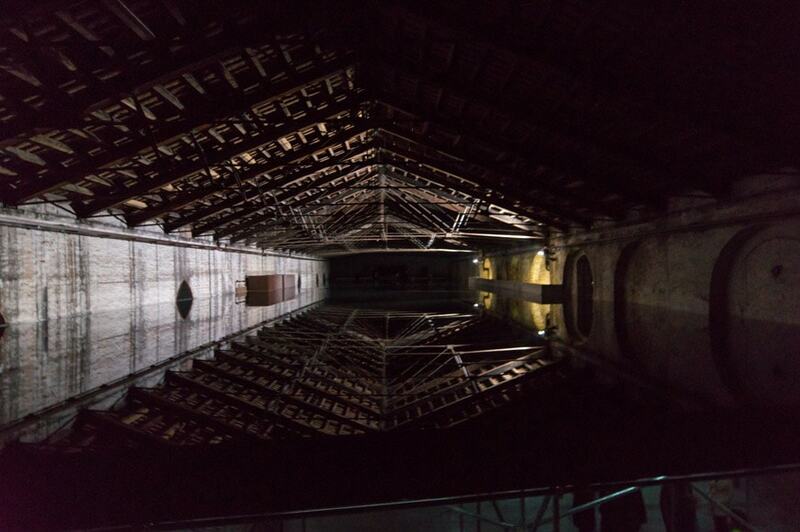 Here, the view is powerful and staggering: the timber truss ceiling of the pavilion is mirrored by a thin layer of dark stillwater which covers the platform supported by the scaffolding, with a deeply disorienting effect. 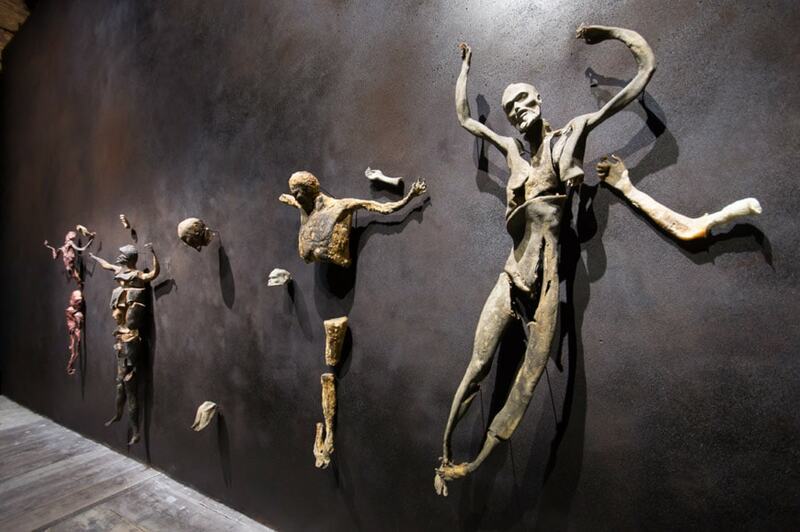 Darkness is the common element of all the three works, as well as a key functional component for their fruition; it emphasizes the dramatic appearance of the bodies in Cuoghi’s installation, it is required in order to watch the film by Husni-Bey, and it is a fundamental constituent of the dreamlike illusory feat of Andreotta Calò.